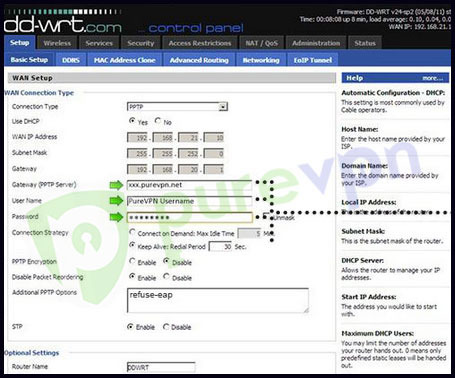 How to Setup PPTP on DDWRT Router? You own a PPTP supported router. You have a premium PureVPN account (If you do not own one, you can buy a PureVPN subscription from here). 1 Please go through from the given description in image. 1a. Shows an Ethernet connect from router to computer. 1b. Shows wireless connection from router to computer. 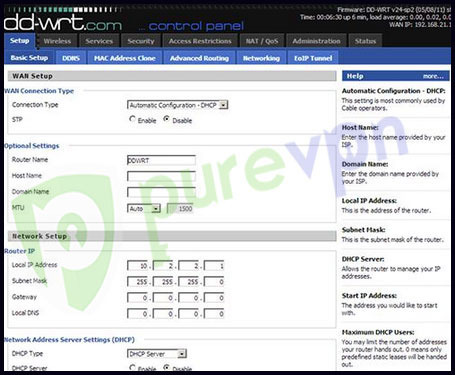 3 Go to “Basic Setup tab” of DD-WRT control panel. 4 Click on Connection type drop down menu and select “PPTP” protocol. 5 Make sure “Use DHCP” is selected as “Yes”. Enter your Gateway (PPTP server) (Example: uk.purevpn.net). Click here to get the complete server list. 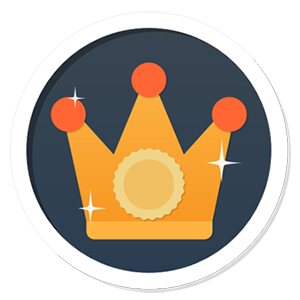 Enter Username & password provided by PureVPN. Write “refuse-eap” in additional PPTP option box. 7 Now scroll down and make sure DHCP server is “enable” and now click “Apply Settings” and then hit “Save”. 8 On the top menu click on “Status” and then click on “WAN” tab. 9 Now Click on “Connect” button under “WAN” tab. But I used the instructions to set up PPTP and it works fine. We are sorry for the inconvenience. Kindly share error logs with us so we may assist you in better way. hello, can I use didated IP on a router in PPTP protocol, and if I can, how can I do please? Thanks for reaching out. You can use Dedicated IP in router as you can see step 6 in above tutorial ‘Enter your server gateway/address’ here you can enter your Dedicated IP address and that’s about it. I followed your instructions to set up the vpn on my DD-WRT router and it works. Unfortunately the connection is really slow. I need a UK server and I tried all the different UK servers from your list, but it was never faster than 5 Mbit/s or something like this. I also tried “fastest-ukserver.ptoserver.com”, but also not really faster. Can you give me any further support to speed up my VPN connection using my DD-WRT router ? Thank you ! PS: When I try to connect with your app (also pptp, UK) from my laptop I get a much faster connection ! my usual speed from my ISP is around 25 Mbit/s. We are sorry for the inconvenience. As you said you are getting good speed in your laptop when connecting to UK servers which indicates that its not our server end issue, it has some thing to do with your Router, having said that we recommend you to try this server, if you haven’t already, it might give you better speed. Try this and update us with your precious feedback. Followed the above to VPN my DD-wrt router to a PPTP server to use P2P without local ISP’s severe throttling. Worked well, however other devices on the same router were unable to connect to the internet. . .even while using your app, changing the SmartDNS or connecting the second device to a different purevpn server. How do I get the 2nd, 3rd, 4th and 5th devices connected – all using the same DD-WRT router? Thanks for reaching out. 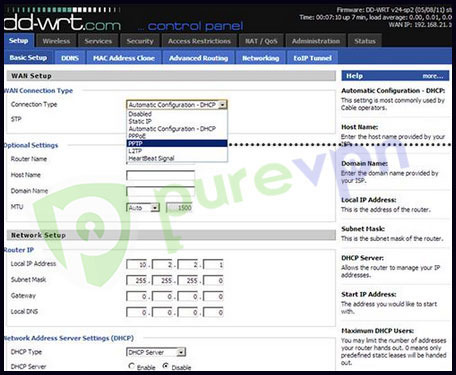 You are suggested to enable “NAT” option in your Router’s settings then you will be able to access other devices. If you need further assistance then feel free to join us on live chat, we are available 24/7! Sorry for the inconvenience. Can you please share the error you are getting, so we may assist you in better way. In the PureVPN app there are so called “Modes” available which one can use depending of their intended usage (Streaming, File Sharing, etc…)… Once i setup PureVPN on my DD-WRT enabled router, how would I alternate between any of these modes? ex: go from “File Sharing” to “Stream”? Thanks for reaching out. Since we do not have a dedicated app for Router, so it would not be possible to use different Modes. However, you can tell us your purpose of using VPN and we can recommend you few best server choices. I alternate between File Sharing and Internet Freedom modes. But honestly i’m not sure i can tell the difference when i do (UL and DL speeds remain pretty constant)… Any any case, recommend away! Thanks for reaching out. You can follow this tutorial https://support.purevpn.com/how-to-setup-vpn-on-linksys-router to configure your router. If you face any issue in configuring then kindly send us screenshots of your Router’s Wan settings page at [email protected] and we will guide you accordingly. Thanks! Simone, Please connect your netgear router with Ethernet wire to your ISP modem. Feel free to drop a line, if you have further question! Thanks for reaching out to us. 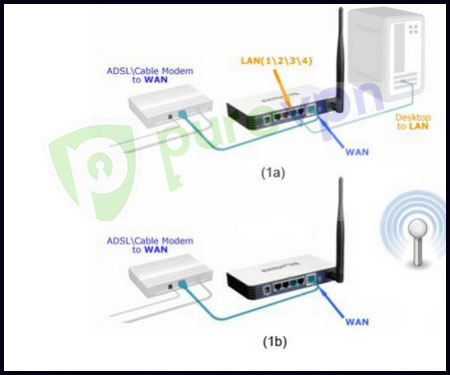 I would like to inform you that you cannot configure both ISP connection and VPN on a same router, you can only use this particularly for VPN purpose only. And you need to select “PPTP” in connection type. Hope it helps, if you still face any issue, feel free to drop us a line OR you can also contact us on live chat, where we are available 24/7 for your assistance! I see. But the netgear r7000 doesn’t have the rj11 connection, so I connect the router r7000 to modem isp by LAN-to-WAN structure. Am I wrong? Might I have to use LAN-to-LAN connection between 2 devices? I configured my house home like the image above in your guide. So I have a router/modem TP-LINK and a netgear R7000 (eith dd-wrt firmware) like a router. I have configured the two devices in way that TP-LINK works only like a modem (so I remove dhcp server and open dmz on the ip router), and I had to configure the netgear with static ip. But with your guide I have to configure PPTP in place of STATIC IP option. So i’m not able to configure VPN on the router. What am I wrong? Feel free to contact us if you still have any question. Since I set up my router as shown, I get my account temporarily disabled because of Excessive Sessions – more than 200! sessions per day. Any ideas how to avoid of this problem? Let me know if you still face any issue! Hi downloaded DD-WRT, & performed the configuration as intructed. I am Glad you could easily set up your router with our guide. Keep giving us your precious feedback, we really appreciate it. Thank you for this wonderful guide. 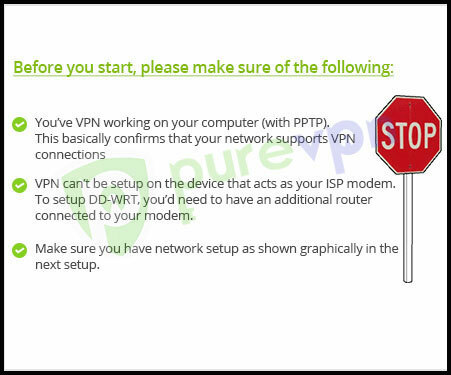 Not everybody can easily configure a VPN on a router so this guide was pretty much required. You are absolutely right, for most people its little hard to configure VPN without any guide and that is the reason we make sure to release guide for everything, so our valuable users like you, does not have to face any issue whatsoever. Thanks for writing, have a good day!